This Christmas fern at Sandra Pond is green year-round. The fern is one of the most common on the eastern half of the United States. A frosty December walk in the woods evokes ghosts of Christmases past, especially when you imagine yourself following in the footsteps of early New England settlers who searched the woods for Christmas fern to use in their holiday decorations. Today when we think of evergreens, ferns don't usually come to mind. Our thinking might have been different a couple of centuries ago. At this time of year we'd likely be on the lookout for the native evergreen Christmas fern (Polystichum acrostichoides), one of the most common and widespread ferns in the eastern half of the United States. Its stiff fronds with dark green, shiny leaflets stand out well against the brown carpet of dead autumn leaves or dry pine needles. Christmas fern is a medium-sized fern that grows in bouquet-like clumps. You might even notice its 1- to 2-foot fronds sticking up through the winter's first light snows. Its old-time use in Christmas decorations is the source of its name. If you look closely at the leaflets on a frond, you'll notice that they are boot-shaped. These leaflets contribute to the name, reminding people of Santa's boots or children's Christmas stockings. The shape of the leaflets also gives the fern its other, more sinister names of dagger fern and sword fern. We usually expect to find ferns in wet, swampy areas, but Christmas fern is usually an exception. You're actually more likely to find it in drier, upland areas. Keep an eye out for Christmas fern by the side of the trail when you're part-way up a hill, especially one that has ordinary ferns growing in the wetlands at the bottom of it. You may also find Christmas fern along a stream bank. Christmas fern is a plant to enjoy year-round in Westborough. A walk along the loop trail in Bowman West (across Bowman Street from the Westborough Conservation Area parking lot) will take you past Christmas fern in places. The hilly section of the loop trail at Sudbury Valley Trustees' Sawink Farm on Walker Street is another good place to look for it. In the spring, new fronds of Christmas fern emerge as silvery fiddleheads in the center of a clump. These are not the fiddleheads that are gathered and sold as a spring delicacy, although there are reports of Native Americans having occasionally eaten them. Later in the growing season, you may notice that the undersides of the top leaflets on some Christmas fern fronds become thick, crusty, and brown-looking. They're crowded with fruit dots, the fern's tiny spore-bearing structures. Like other ferns, Christmas fern reproduces without flowers or seeds, using an older style of reproduction that involves spores. 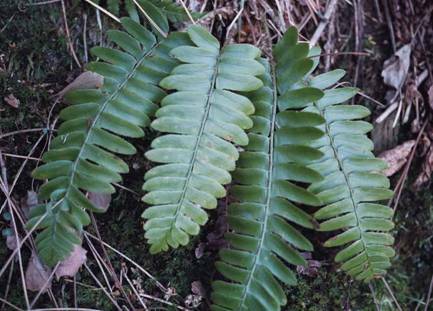 Various Native American groups used the root of Christmas fern for medicine. They applied it externally in a poultice for rheumatism. They also drank a root tea to treat rheumatism, pneumonia, fever, and chills, as well as to bring on vomiting in cases of stomachache. In the modern day, Christmas fern is useful in erosion control, especially on shaded, rocky hillsides. It tolerates dry conditions and some sunshine better than most ferns. In gardens, our native Christmas fern can be attractive year-round in shady areas. It doesn't spread quickly and resists disease and insects. Several forms of Christmas fern are available with fancy or more finely cut leaflets. A good place to visit to see the different forms of Christmas fern in a garden setting is the New England Wild Flower Society's Garden in the Woods in Framingham. It is open mid-April to mid-October and has a web site at http://www.newfs.org.